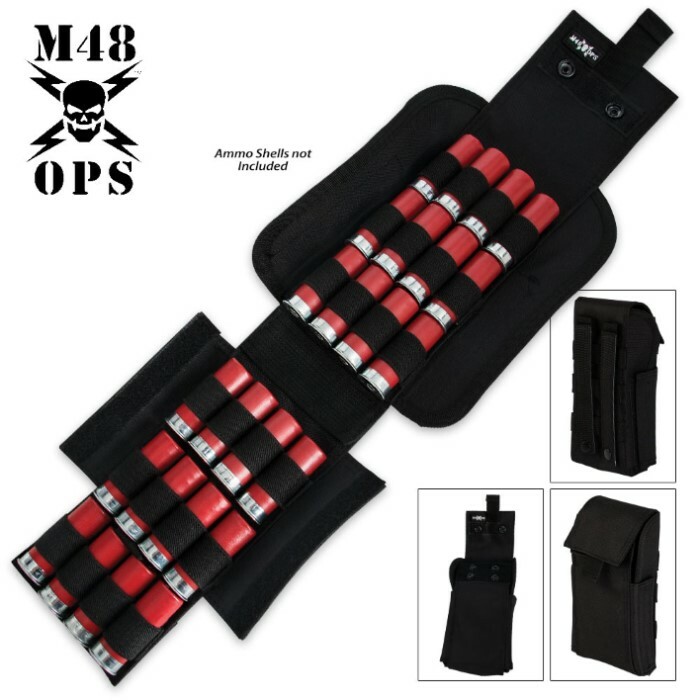 Look no further for a sturdy, easy-to-access ammo pouch because the M48 OPS Shotgun and Airsoft Ammo Pouch in OD is exactly what you need. This pouch is made of 600D durable nylon and has a MOLLE compatible construction that lets you integrate it into your attire with no problem. The Velcro and snap closures provide security but easy access at a moment's notice. This pouch will hold a full box of shotgun shells so that you never run out. Just got one,,,worked for over half an hour trying to combine, reconfigure, place some upside down,,etc. to get them all in. But there is NO way to close the top to even reach the velcro, let alone the snaps with a top layer filled, so I have to leave empty those 5 spots.. Only can get 20 shells inside, of which only four are of 3" length; all others shorter. Doesn't matter much to me, as I've got a mixed load of 12 ga buckshot, slugs, and 4-shot all for home defense use. Solid construction and worth the low price at least. The photo only show 2 snaps on the flap, but mine came with 4. Don't even need them 'cause there is a full velcro strip around the snaps. M-48 makes a product that should cost twice as much. Heavy duty and perfect stitching. Check out their tactical response pack, too. My edc. I ordered two of these one green and one black, the black one arrived with a box cutter slash through the packaging and the ammo pouch so I will send it back for a replacement. These are far better than I expected, the photo shows 24 shells and that is what I expected but there is a loop for the 25th shell between two of the rows. You can also turn this into a survival kit with extra ammo (note you can put two 30-06 or 308 etc. or three in 223 in each loop) and even some first aid supplies or a compass and small AA or AAA flashlight and don't forget the fire starter. I'm going to order two more of these they are very compact for all they can hold. Once I get it set up the way I want I won't go afield without one. Saying goodbye to bandoliers. MOLLE capable means I can place how many I want and where. Sealable pouch means any shell that slips thru its loop is still retained in the pouch. Overstretched elastic loops have always been the biggest issue for bandoliers. At least in my experience. They also pack flatter, and are easier to store in the safe or a BOB. The internal layout allows for different loads to be positioned for easy transition. I've got two. Eventual goal is 10. I love this item, it holds my 12 guage rounds perfectly, i plan on buying myself another, and maybe one for my brother in law, and it fits to my tactical vest very well. very nice... wont close all the way with 25rds but 24rds is good. yes I will ordering more.